“Four Freedoms” mural near Weedsport. The eyes of the world will soon be on the historic murals and heritage art of the Erie Canal region with the announcement by the Global Mural Arts & Cultural Tourism Association that Western New York will be the location for its 2016 Global Mural Conference. The announcement represents a major boost to local artists, especially muralists, and to the Erie Canal region’s heritage preservation efforts. 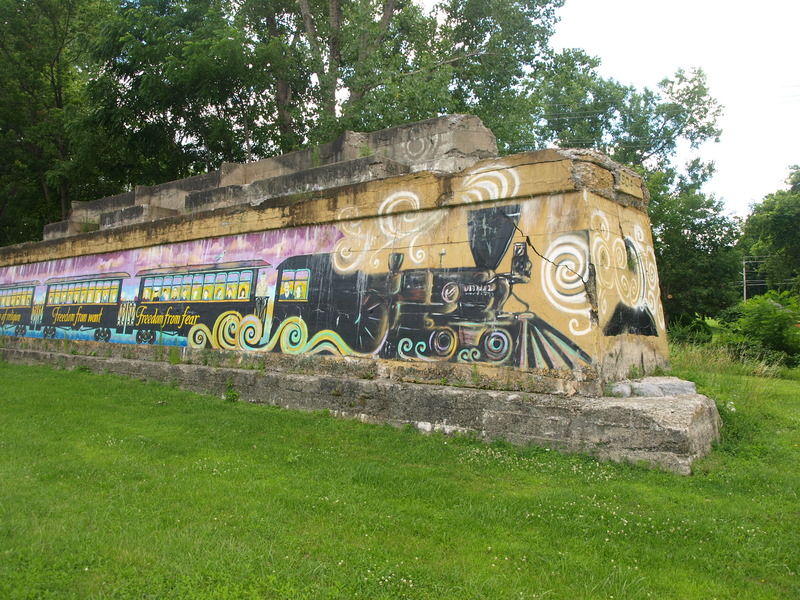 Mark DeCracker, a local supporter of Erie Canal murals, attended the 2014 Global Mural Conference in Sherbrooke, Quebec, to make the case for the conference coming to western New York. Prior to the 2014 conference, U.S. Senator Kirsten Gillibrand also held a news conference in Macedon to announce her support for the event coming to the Erie Canal region in 2016. DeCracker, founder of Mural Mania, a community art program that showcases historic murals, will be coordinating the 2016 conference. Dates and exact locations for the conference have not been confirmed, but DeCracker is looking to schedule the event in September. Besides his zeal for all things artistic and canal-related, DeCracker has also been deeply involved in trail development efforts in Wayne County. He is a board member at Trailworks, Inc., a non-profit that advocates trail development in the area, and has led the effort to create the Lyons Trail of Hope a quarter-mile, fully accessible trail surrounded by a variety of themed gardens. Mark has been honored by many Canal-related organizations, including PTNY which presented him with its “Out of the Box” award in 2013. Congratulations to the artists, historians, and canal enthusiasts along the Erie Canal, and especially those who contributed to the creation of the murals that tell the Canal’s story. Attendees at the 2016 Global Mural Conference will learn something that we’ve known all along – the Erie Canal region is a place where history comes alive! Read more about the announcement at the Democrat & Chronicle. On Saturday, August 9th a new, canal-themed mural was dedicated in Minetto as part of the Magic in Minetto event. Richard Drosse, a local canal and trail supporter in Oswego County, was kind enough to share the following bit of the backstory behind the mural’s creation with us. “Minetto’s Beautification Committee was interested in having a mural depicting a historical canal scene, on what was previously a buoy storage building for the Canal Corporation at the River View Park. The committee contacted Minetto Elementary School art teacher, Crystal Mason. With the help of Crystal’s art club, they researched historical canal scenes, with the club drawing and creating the image for the mural. Needing to find artists that could paint the mural, the AmeriCorps division of the City-County Youth Bureau was approached. 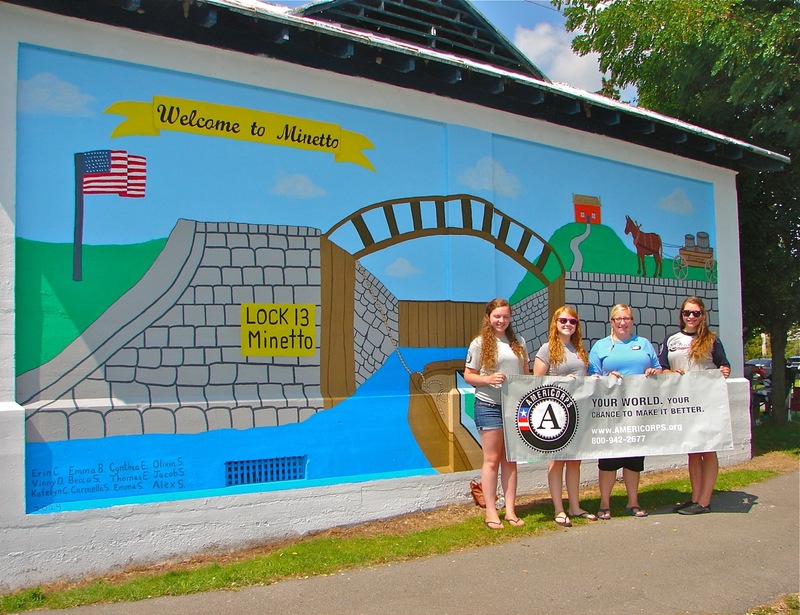 The AmeriCorps motto is “Getting Things Done.” Four of Oswego AmeriCorps members, Cynthia Kellogg, Erin Chetney Emma Belcher, and Becca Smith expressed an interest, and then sprang into action this summer to do the mural. The AmeriCorps members chose to paint the riverside canal building mural for their summer Community Involvement Project. AmeriCorps engages more than 80,000 Americans in service each year at nonprofits, schools, public agencies, and community. The Oswego branch of AmeriCorps is overseen by the Oswego City-County Youth Bureau. Thanks to Richard Drosse for keeping us informed, and to the Americorps group for bringing Canal history to life in Minetto! Americorps members in front of the new mural.